Our first introduction to what the world is like comes through our parents. We look to them for guidance, reassurance, modeling, and wisdom. In the first few months to years of our lives our parents comfort, teach, lead, and share their wisdom with us that will ideally give us the confidence and tools we need to grow into secure whole individuals who can successfully launch into the stages of adolescence and young adulthood. The role of the father (or a strong male model in a child’s life – stepdad, uncle, coach, mentor) is key in shaping a young person’s self-esteem and sense of identity in the world. Adults that grow up without a strong father figure in their lives are more likely to suffer from depression, anxiety, self-destructive behaviors, and a sense of worthlessness. When my husband walks through the door at the end of the day the first thing our 19-month-old son does is run to the door enthusiastically yelling, “Dada!” with his arms up in the air. All he wants in that moment is for his father to stop and acknowledge him being fully present and engaged. No matter what age we are, the desire to be acknowledged, seen and heard by our parents never goes away. The spiritual role of a father figure is to help shape the child’s self-esteem. Children see their self-worth through their father’s eyes. They look to their fathers for the reassurance that they are loved, valued, accepted, important, and worthy. The key to raising strong, healthy, thriving children is consistency and presence. Like most things in life, it’s such a simple concept that it seems hard. The best thing a father or father figure can do for their child is to be present. Notice I didn’t say to buy presents, rather, to be 100 percent present. It’s so easy to get caught up in the daily grind of work, paying bills, taking care of a home, family, etc. This daily stress can steal your joy and keep you from being present with the people you love the most. This Father’s Day, give yourself the gift of being present. Practice taking time with your children, step-children, nieces, nephews, neighbors, and loved ones to give the gift of your attention. Simply stop to look into the eyes of your child or someone you love and offer your praise and approval. Research shows receiving consistent, positive, loving words of affirmation from our loved ones can boost our immune systems and help us live longer. How amazing is that? Praise, attention, and presence keep us healthy from the inside out. Happy Father’s Day to all the fathers and father figures out there! Enjoy the gift of being present with the ones you love and watch them bloom and grow from the inside out. Meghan Fritz is a psychotherapist at Sunpointe Health in State College. Bob Etzweiler calls his grandfather his hero, and it is easy to see why. 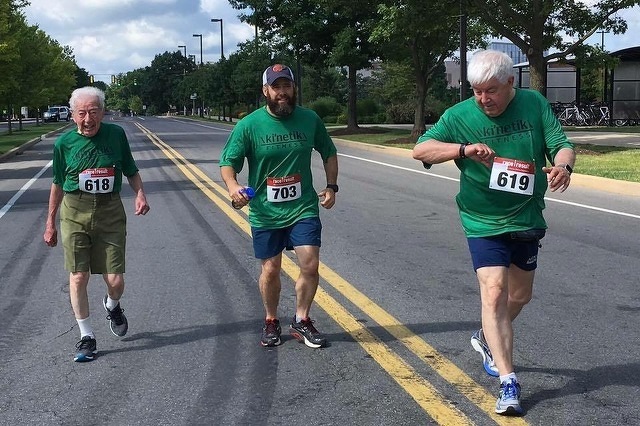 State College legend George Etzweiler will be running the 7.6-mile Mount Washington Road Race in New Hampshire on Saturday, the day before Father’s Day. The race is a 4,650-foot climb up the highest peak in the Northeast. And, the most impressive thing is that George is 98 years old.